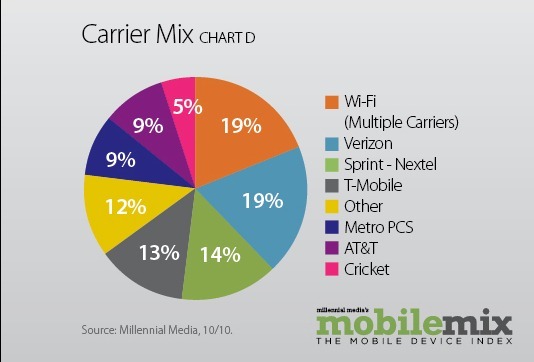 Millennial Media has released their Mobile Mix for October, and at first sight, the results are fairly impressive. Before diving in, though, it's important to note that the statistics are based on ad clicks, rather than a population sample. However, that doesn't mean they don't help express the overall trends, so with that in mind, let's take a quick look at the highlights. · Apple, the leading device manufacturer on our network for the last thirteen months and accounted for a 25% share of impressions on our network in October. · RIM ad requests increased 43% month-over-month. · Motorola became the number three manufacturer and held a 15% impression share. 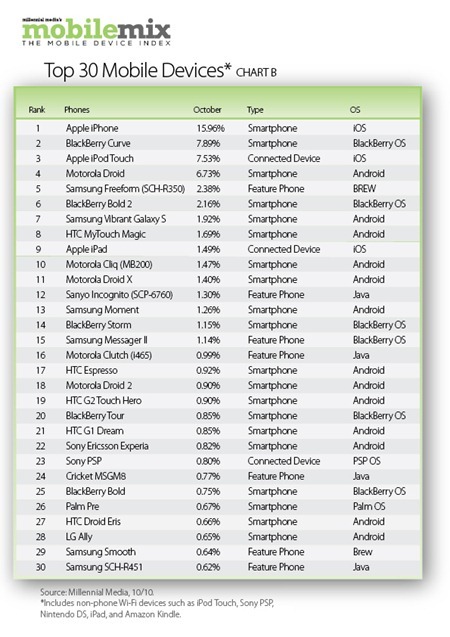 Two new Motorola devices, the Droid 2 and the Droid X both made their entrance into the Top 30 Mobile Device list. 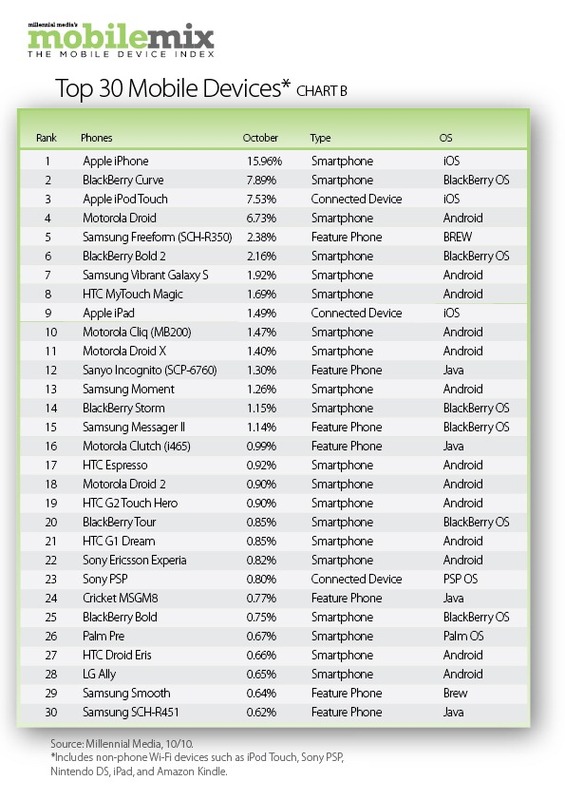 · RIM devices represented six of the Top 30 Mobile Phones, with the BlackBerry Curve taking over the number two position this month from the Motorola Droid. 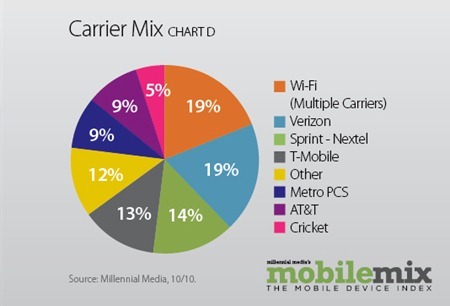 · Connected Devices, Apple iPod Touch, Apple iPad and the Sony PSP made up 3 of the Top 30 Mobile Devices on our network. 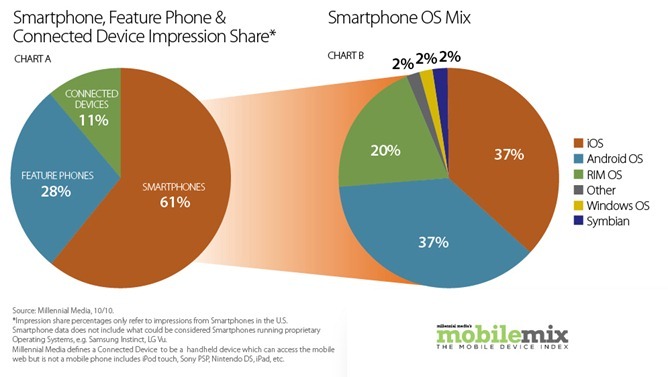 · Smartphone impression share increased 7% month-over-month and represented 61% of the Smartphone, Feature Phone & Connected Device Impression share in October. · Non-U.S. impressions on the Millennial Media network have grown 20% faster than U.S. impressions since January. · Games, Social Networking and Mail & Messaging were the Top Three Global Mobile Application Categories in October. The underrepresentation of AT&T suggests that Millennial's network exposure isn't perfect: AT&T only represents 9%, when in actuality it has a far larger customer base than Sprint (13% according to Millennial). The discrepancy could be because of a higher rate of smartphone usage on Sprint, but it's hard to say for sure without looking more deeply. Good to see Android continuing to grow, especially in this context; additional ad exposure is good news for devs, which translates to good news for everyone.